1. Leaders need to help their team win with the small things. While there were several key moments in the game, I think Chris Long, defensive end for the Patriots, summed up the prevailing attitude. When asked about what they discussed at halftime, he said, “We’ve got to keep our heads down and do it one play at a time.” Excellent advice for any office team or even a family. It’s the day to day work of a team that is critical and not expecting that one big moment will change everything. It rarely does. 2. Success requires a crazy level of focus on achieving the desired outcome. Did you see that 33 yard catch by Julian Edelman on the final drive of the 4th quarter? WOW! 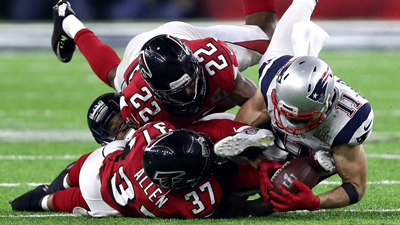 Even with all the Falcon defenders swarming around him, he made the catch. Talk about an intense level of focus. If he had taken his hands (or mind) off the ball for one millisecond, the pass would have been dropped. If there’s one place I believe organizations and leaders within them could make significant progress, its in helping their employees focus more on outcomes than on activity. Helping them better manage the tsunami of distractions facing them ever day. 3. Leaders need to have everyone on their team fully engaged. After the game, NE quarterback Tom Brady said: “We all brought each other back.” What a powerful picture of team members supporting and encouraging each other, especially in times of adversity. No one person can carry the whole team or do it all. As a leader it is just so important to constantly be growing your team members so they can take on more complex tasks. How could you change your actions as a leader to help your team "score" better results?